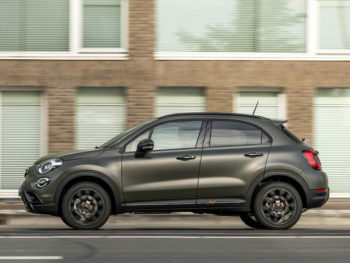 Fiat is adding an S-Design trim to its 500X line-up to bring exclusive styling features. Based on the City Cross model, the 500X S-Design adds in black roof bars as well as black inserts on the door handles, boot lid, front moulding and door mirrors as well as 17-inch alloy wheels. Inside, the S-Design features an exclusive upholstery and a textured matte black dashboard fascia with a copper-coloured ‘500’ badge. It’s available with a choice of FireFly Turbo petrol engines, comprising a 120hp 1.0-litre three cylinder with six-speed manual or a 150hp four-cylinder 1.3-litre with six-speed DCT auto. Standard equipment includes LED headlights and daytime running lights, rear parking sensors, leather steering wheel with audio controls, instrument panel with 3.5-inch colour TFT and double USB port, automatic dual-zone climate control and cruise control. The S-Design also features the seven-inch Uconnect system, with Apple CarPlay and Android Auto compatibility, and standard safety assistance systems including lane assist with intelligent speed assist and traffic sign recognition.